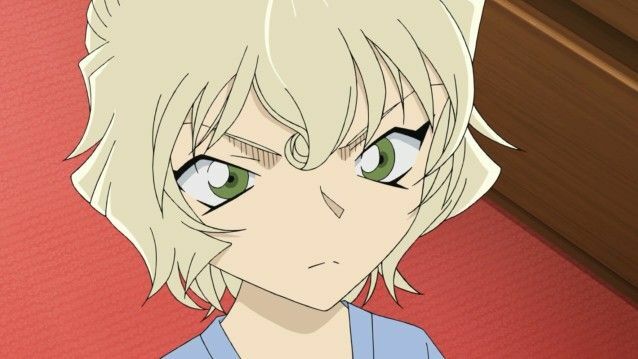 If this leads to a big change, like Ran finally knowing everything, then... I don't have words for how happy I'm gonna be! This should have happened years ago when there weren't any jokes left to make about Ran not knowing. I can't remember the last time I was really excited about a new DC chapter. I'm still sceptical this will actually happen though. We will know soon. Same here. Keeping my expectations medium as it could be another tease, but also because I'm less skeptical of it the possibility of Ran finding out permanently, but more skeptical towards the emotional payoff being worth the long wait. Especially with how for a long time Conan hasn't been allowed to be wrong or portrayed officially as a flawed human. Even then in the better half of the series, Game Company Murder Case and Reunion With the Black Organization don't really invalidate the secrecy approach and while there might be some consequences for the worse due to keeping a tight lid on things I don't know. I mean if Conan isn't meant to be entirely in the right by keeping up the deception, I'd think there would at most be a scenario like those cases where keeping quiet resulted in a high body count or at least on a personal scale allow Ran to feel unsure about her relationship with him. Not angry or hateful, just being forgiving while thinking maybe that they don't have the making of a good couple if she couldn't be trusted with his secret at least so Conan/Shinichi has some much needed growth in remembering that he doesn't always know what's best. Those have been my worries too. The secret is gonna come out one day, and with so much time passed, I can't really imagine how Ran is gonna take it. Conan's worries are valid, but Ran is in huge danger of being targeted anyway, so maybe she should be prepeared? I'm not 100% sure. 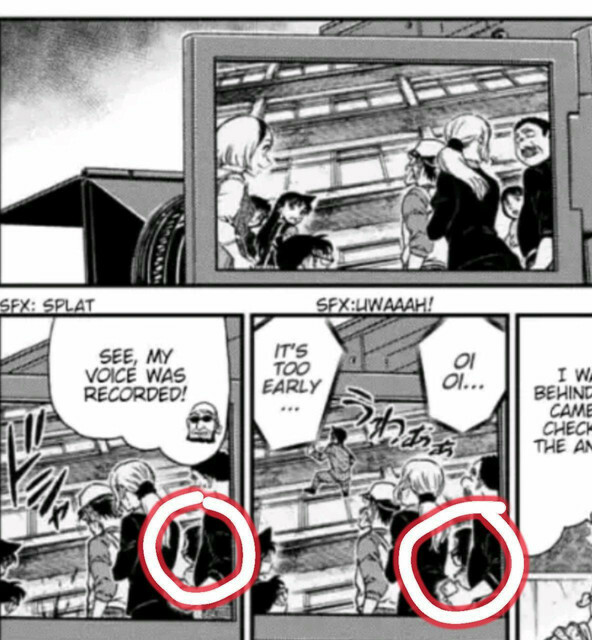 Still hoping she'll know everything a while before the series end as that would bring a change that will be visible in almost all chapters from now on. Thank you! See there's even been an example of what you suggest that sadly the manga never really addressed with "Black Impact! The Moment the Black Organization Reaches Out". Namely how Ran and Kogoro were in a situation that coming clean would have made things relatively easier (Akai showing up being dumb luck on their part). 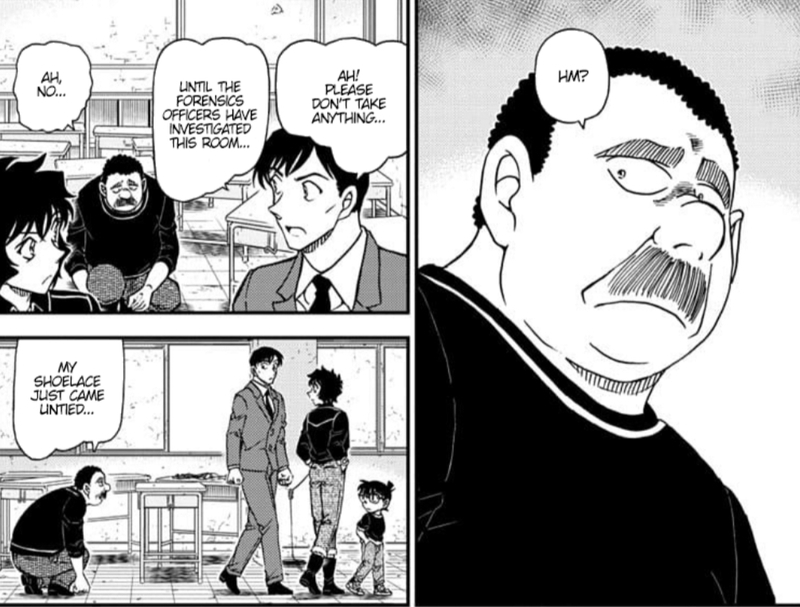 But nope, not even a following moment in the next chapter where three of the "smartest" characters at least reflect on how the secrecy would have been moot, plus it shows that if Gin would to find out, he'd likely plug Ran and Kogoro with bullets anyway than honorably checking to make sure if they are aware of the Organization or not. Heck even The Shinkansen Bomb Case showed that Conan wasn't completely aversed to trusting Ran with the secret if telling her was the only viable option. What makes me wonder is, what is Masumi's motivation to "expose" Conan/Shinichi i nfront of Ran? It kinda seems that she wants to test if she's in the secret, but shouldn't it be already obvious to her, that she isn't? I completely forgot those cases. Planning on rereading everything soonish. More trouble Conan will have to deal with someday is how he's used people (mostly Kogoro) to solve cases. I hope Ran won't let that go too easily. And how is Kogoro gonna do after Conan leaves? I really hope Aoyama will take us through all these problems. I don't think they'll be easy to solve. Yeah, I suppose the reason I'm unsure about getting the right payoff is that the manga has lacked much in showing Conan as a flawed person compared as it use to in earlier stories which I've sent to you in a PM and would be glad to do so for anyone who is curious about my claim. But I also look at the follow up to the London case. Yeah couldn't really be happy for the confession and Ran's follow up to it. 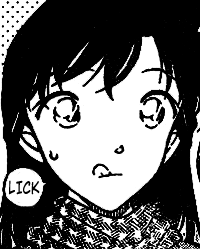 Aside from it feeling like Gosho wanted to attempt change, but still playing it too safe, Ran is just a little too eager to be the future Mrs. Kudo. I mean she knows that he has been dishonest with her in the past even if she needs proof on the Conan thing (like being nearby when he claimed to be elsewhere), but the kiss and eagerly wanting to be his girlfriend inspite of that? No, she could still turn him down without the anger by simply stating that neither of them are ready for that kind of relationship and that they still having some growing up to do. Ah, back when flaws helped making the series interesting. Those are good points that I remember well now that you mention them. So direct, and in front of several people. That was just weird. Guess I gotta wait for her next sentence before I make a proper opinion though. EDIT: But I guess she'll be interrupted by the next murder. Actually I want Sera carrying Conan around to become a regular thing. well Sera spilling the beans to Ran about Conan and Shinichi NOT being seen at the same time is nothing to be excited\worry about. 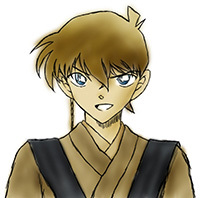 Unless the current file ends up with Rum disguised as Shinichi kidnapping Ran away from Conan... otherwise it can be well expected that this case being easily resolved by one of the Shinichidoubles (Heiji, Kaito Kid or whatever the kid carrying the sword's name is) showing up to be present at the same time along with Conan and saving the day. 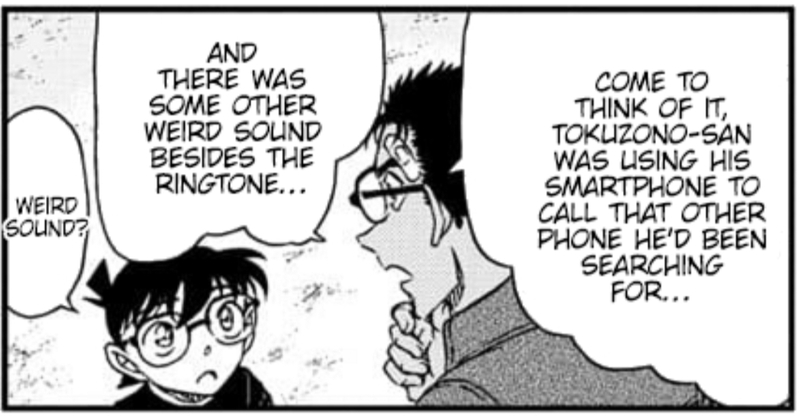 Well even if she does question the fact that when Shinichi appears Conan mostly isn't at the same scene, he could still refer to the case from chapter 255 following, where Haibara disguised as Conan while Shinichi ran around as Shinichi. So that is atleast one "prove". I can't remember any more tho. 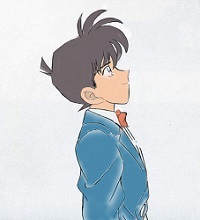 ShadowNeo wrote: Well even if she does question the fact that when Shinichi appears Conan mostly isn't at the same scene, he could still refer to the case from chapter 255 following, where Haibara disguised as Conan while Shinichi ran around as Shinichi. So that is atleast one "prove". I can't remember any more tho. That one basically got made "irrelevant" in chp. 481, when Ran first though of it to debunk her suspicion, but then quickly dismissed it, since "Shinichi is a sneaky person". Either that, or he noticed the other guy looking up there before the victim fell. Or there is something bigger. 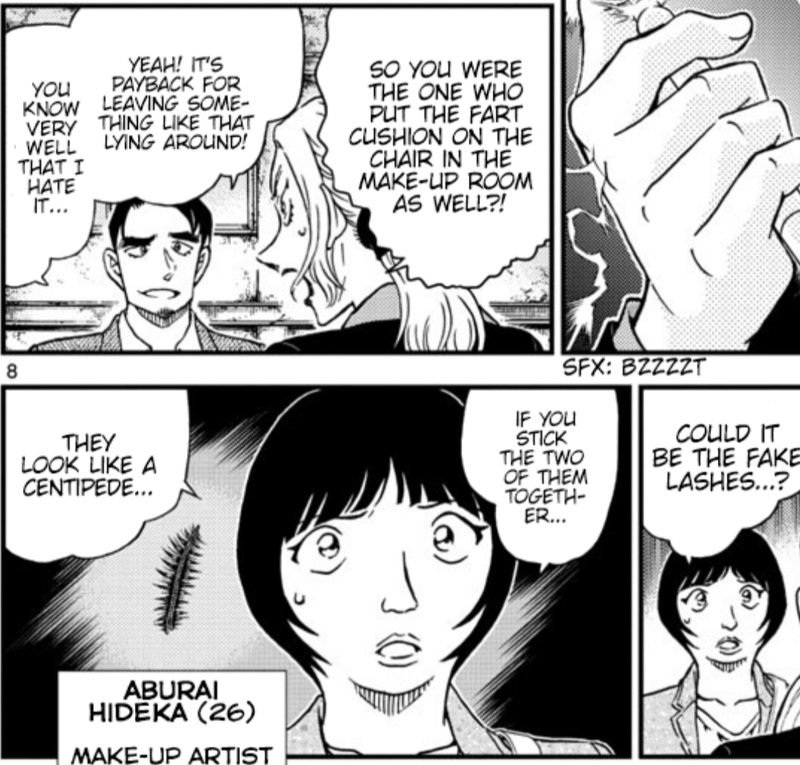 a) Even if Hoegi(PA)/Aburai(Make-up artist) was the culprit a proper camera angle could have got the victim doing funny stuff on the leadge or falling down suspiciously. b) The director set the camera angle in such a way that it won't film the fourth floor. d) Also his little statement provided perfect alibi for him. Yep, that could be it, too. So the question is, did our easy-going director do it? Or did one of the two more low-key people, in terms of personality, do it? I don't think the actress did it—anyone think she actually did? 1,024 spoiler pics are now out. Magazine break next week—we can expect 1,025 spoilers in two weeks. Ok, so to go through the case... the former PA probably died due to getting shocked by Tokuzono's prank while driving. As Odori pointed out, he reacted strongly during the blood-soap prank, so him losing control while driving makes sense. Makoto said that he heard another weird sound along with the ringtone, and Odori later notices something on the ground that makes him suspect the culprit. That was probably something that either was stepped on and made sound, or was something that's remaining from whatever that caused that sound. When Odori looked at the footage and started laughing, you could notice that something in the footage confirmed his suspicion. If you observe the suspects behavior as Tokuzono falls, all of them follow his fall with their head, except Aburai, the makeup artist, who is still looking up, as if she wasn't fazed by the sudden incident, implicating her as the culprit. Aburai could thus be the culprit who made Tokuzono fall, by scaring him with a trick that made him think an insect was close by him. She was the one who even mentioned the fake lashes trick that can make it look like a centipede. This could be the implication of her testing his fear of insects with lashes before, so that she can use a similar insect-related trick now (being a make-up artist, coming up with such an idea with the fake lashes, which she uses a lot, makes naturally sense). What Odori noticed could be something connected to the fake insect trick, and perhaps the sound is a part of the illusion too.